Location. 39° 54.148′ N, 75° 34.702′ W. Marker is near West Chester, Pennsylvania, in Chester County. Marker is at the intersection of South New Street and Birmingham Road, on the right when traveling south on South New Street. Touch for map. Marker is in this post office area: West Chester PA 19382, United States of America. Touch for directions. Other nearby markers. At least 8 other markers are within walking distance of this marker. 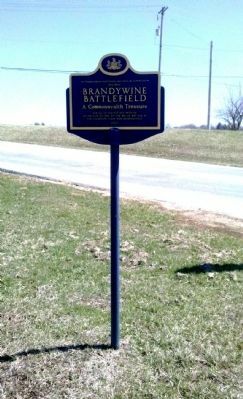 Sandy Hollow (about 400 feet away, measured in a direct line); Battle of Brandywine (about 400 feet away); William Darlington Birthplace (approx. 0.6 miles away); Dilworthtown (approx. 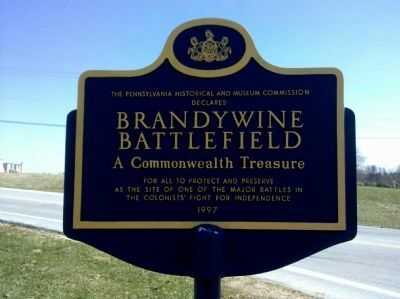 0.6 miles away); a different marker also named Battle of Brandywine (approx. 0.8 miles away); Birmingham Hill	(approx. 0.8 miles away); In Memory of Those Who Fell (approx. 0.9 miles away); First Defense Line (approx. 0.9 miles away). Touch for a list and map of all markers in West Chester. Click here for a list of markers that are related to this marker. To the North of this marker is an easy trail, with a parking area, worth the visit. More. 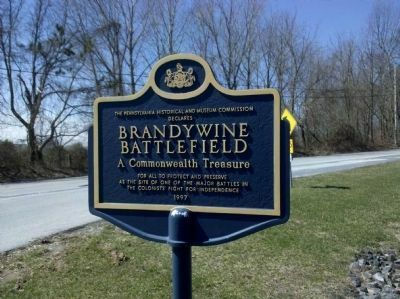 Search the internet for Brandywine Battlefield A Commonwealth Treasure. Credits. This page was last revised on June 16, 2016. This page originally submitted on March 30, 2011, by Keith S Smith of West Chester, Pennsylvania. This page has been viewed 710 times since then and 8 times this year. Photos: 1, 2, 3. submitted on March 30, 2011, by Keith S Smith of West Chester, Pennsylvania. • Bill Pfingsten was the editor who published this page.